Phrases Only a Cancer Patient Will Hear (or Say) . . .
Quick post tonight to ask for prayer . . .
Tom has a very bad case of the flu. He is quarantined to our room and the main bathroom. I’m wearing a mask when I go in to take him food and drinks. I’m washing my hands and using hand sanitizer CONSTANTLY. Please pray I can stay healthy. When I talked to the oncologist on-call today, she said what I was doing was good. She also asked about my white blood count, which thankfully was not a concern at my last chemo. She said that was good as well and to keep doing what I was doing. I’m glad she didn’t say to move out for a few days! This is the first Wednesday in a long time I haven’t had to get up and go to chemo. So instead, I’m sitting/laying around in my bathrobe. I wish I could say I’ve been celebrating the past few days, but the side effects from my last dose of chemo hit me really hard starting Monday afternoon. So hard, that I had a to cancel a fun night out with friends and had to call on a friend and my aunt at the last minute to help, because I was so nauseous and weak, I couldn’t take care of the kids and Tom was working and out of town. I’m out of bed today, but still not able to do much. What a nice reminder about how horrible chemo really is! 🙁 Boo!! Glad it’s over!! Over the past 4 1/2 months, I’ve done a pretty good job of physically hiding the true “look” of chemo. There were only a few days I didn’t put makeup on and I hid my hair or lack there of, with a hat and a wig. The friends and family that helped in our home, saw me without a hat, but whenever I went out of the house, my head was covered. 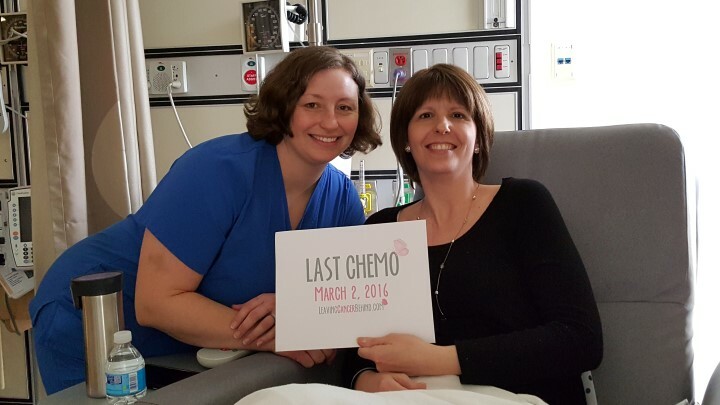 Besides Tom and the girls, Christy and Sarah are the only ones who saw the true chemo “look” as they were at our home in early morning before I got ready. Until today . . .
Today, I thought I’d make a short video and show you all the faces of chemo. With all the poison being pumped into your body during chemo, it’s only natural that it takes a toll on your physical appearance. I’ve never been one to leave the house without makeup, and during chemo was no exception. I did everything I could to physically hide that I was sick. Toni, one of the nurses I had the privilege of working with, came in to check my chemo, give us a high five and took time to take a picture with me. My infusion was uneventful again, which I’m thankful for. I slept through part of it which made the time pass by fast. Tom and I went to lunch at MOD Pizza and then I came home and laid down. I’m tired, but feeling fine. It’s been a LONG 4 1/2 months of chemo. But here I am, the night before my last chemo. I can’t believe it will be over tomorrow (well not really, but at least the infusion part of it). 4 1/2 months ago we prepared for the worst – my full time care with Tom working from home and a friend here the day he was up in Seattle working. Fortunately, it was not as bad as we had prepared for. There were some very hard days, but there were also some good days. It’s the very end of chemo and today, I was able to be a normal mom, taking our 6 year old to the Dr. for her allergies and going to school play auditions for our 2 oldest kids. I am so thankful my body handled the chemo as well as it did!! I’ll be honest, I have mixed feelings about tomorrow being my last chemo. Don’t get me wrong. I’m very glad it will be over. I just really want it to be my last one, forever. I don’t ever want to walk back in the infusion center again in my entire life, for me or for anyone else I know. It’s not a horrible place. The nurses and people that work there are wonderful and I have loved getting to know them. They are very friendly and kind. They know us by name and greet us with a smile each week. I’d love to run into them when we are out and about. But never want to see them at the Infusion Center again. 🙂 I look forward to saying goodbye tomorrow and taking them some yummy blueberry scones as a “Thank You” for taking such good care of me these past 4 1/2 months. We have been focusing so much on chemo and managing the side effects that come and go each week. It seems strange to be coming to an end of that. Counting the days . . .
Another chemo is done and it was again, uneventful. I slept most of the time as I was very tired and a bit achy today. I also took a couple small naps today and laid down until the kids got home from school. There was not much new news at my Dr. appointment yesterday. The tumor seemed about the same size. After Tom and I coordinate a couple calendar items, I can call the breast surgeon and get that appointment set up to talk about surgery. We are hoping to schedule surgery the week after Spring Break (April 11- 15). I also have an appointment on March 25th to hear the results of my pet scan which should be done a few days prior to that.